for you kitchen. This giveaway will contain 10 products that every kitchen should have. So let’s wait no longer to see what all is included in the prize packages. Vegetable Peeler – Y Shaped Peeler made with high quality stainless steel and an ergonomic handle for easy forward & backward use. Works perfect for both the right or left handed. Get to peeling all your fruit and vegetables in a snap with this Ergo Chef easy Y peeler. It works both directions – forward & backward for quick light work. This 3pc. Locking Kitchen Tong set has a 9″ pair for serving and small stove top cooking. A 12″ Pair (Tested & Recommended by Cooking Club of America) when you need a bit more reach and a 15″ Pair for the grill & professional kitchen. They feature 500 degree silicone heads on one side for non-stick pan use, and steel teeth on other side for picking up anything you need a real firm grip on. Will pick up anything, from Ice, pasta, vegetables, to shredded lettuce, salads, chicken, steak, & pork. Anything! You can even stick them in a deep fryer and let the slot in one head drains the oil before plating. Or use the other solid head side for scopping sauce while plating. The non-slip grip handle keep you in control & locking slide ring keeps them closed when storing & opened when in use. This 7pc. 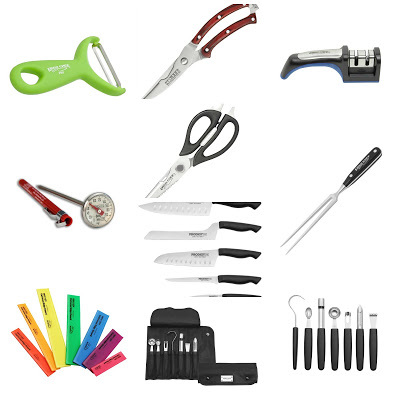 Garnishing Kit is made from High Carbon Stainless Steel and ABS injection molded handles for durability. It’s professional grade quality will get your through all your garnishing tasks. Includes: Parisian Scoop (1.2″ Dia. ), Oval scoop (.650″x1.125″), channel knife, butter curler, apple corer, zester, Peeler & Soft 7 Pocket Nylon Roll Bag with two button snaps for secure tool storage. Get garnishing with this culinary kit and create beautiful presentations for your family & friends. This instant read thermometer has a 1″ Diameter Dial for easy storage. It’s NSF certified and accurate from 0 – 220 degrees F. It has a nut on the back for calibration. It has a shatter proof clear plastic lens and is constructed with durable stainless steel. Comes with a sleeve and clip for the Chef’s pocket and safe storage. Care:Hand wash only. The Ergo Chef Pro-Series heavy duty carbon stainless steel kitchen shears are a total of 8.750″ long and come apart for easy cleaning. The blades are 3.375″ long. Key Features: Durable ABS & ergonomic non-slip grip handle. Bone cutter & Wire Notch, Vegetable Peeler slot in blade, also good for herb stripper, one side wavy edge fish scalier, Bottle Opener, Twist Bottle Opener and Nut & Lobster Cracker in the middle of the handle, and screw driver/ lid lifter. A Multiple Purpose Shear that gets many jobs done and a must have in any kitchen. The Ergo Chef 8″ Fork has thick square shaped fork prongs to provide strength for picking up large roasts, and hams etc. The well balanced comfort handle is solid injection molded POM with a full tang for durability. The handle has a triple rivet design with our logo inlay on one side. The perfect fork for carving and serving your meals. These Ergo Chef CRIMSON Kitchen & Poultry Shears feature a heavy duty blade from .150″ thick carbon stainless steel for durability. The blade is spring loaded for better control with a clasp to keep them closed for safe storage. Designed to easily cut poultry bones, trim excess fat, & even use them in your garden. Make your kitchen shears the new heavy duty CRIMSON Series. Ergo Chef 7 piece edge guard set. This 7 piece knife Edge Guard set was picked as one of Giada’s great finds and gifts at the Metropolitan Cooking & Entertaining show in Washington DC. These Universal Edge Guards are made from durable ABS plastic and fit most knives firmly for safety & edge protection. Great for all your knives when storing in a drawer protecting the blades from hitting other tools. Great protection for your fingers when sorting through your drawer to find what you need. The bright colors provide knife distinction helping you get the knife you want. This PRODIGY Series commercial grade 5pc knife set was designed for the professional and home cook who shop for exceptional value and want a reliable knife set without spending a bundle. Designed for ergonomic comfort and precision. The blades are crafted from high carbon stainless steel and have an 18 degree cutting edge so they can slice, chop or carve up any food product you need. The handles are seamlessly molded to prevent bacteria issues and provide a non slip grip for precise control & safety. This knife set includes the following: 8″ Chef knife, 8″ Bread knife (Offset), 7″ Santoku knife, 6″ Boning knife, and a 4″ Paring knife. Enjoy preparing meals with the Prodigy Series. allow two weeks from the conclusion of this giveaway for the prizes to be shipped.